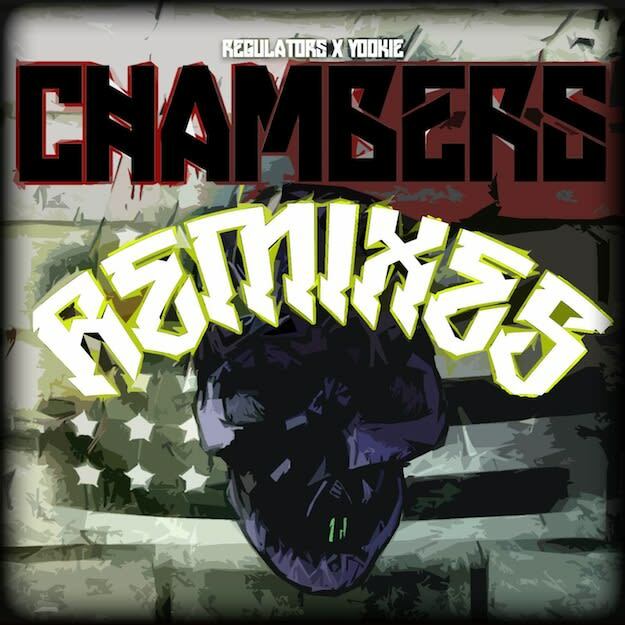 YOOK!E & Regulators fucked around and crushed the game with their single "Chambers." Hosted and supported by Run The Trap, this wonky trap tune netted 50,000 plays and saw quite a bit of blog love. The remix EP that has been packaged up to follow is absolutely bananas, as TAGRM, FootwoRk, and Benasis were called in to flip the original. This also offers up two collabs, one from Choppa Dunks and Prince Fox, and the other with 8Er$ and Kurk Kokane. London&apos;s Ddark lends original vocals to the 8Er$ and Kurk Kokane flip, and YOOK!E also stepped back in to restructure and flush out the original. We&apos;re left with six incredibly unique remixes, and the team threw the original in for good measure. But at the end of the day, this is a clinic on musical solidarity. Representing London, France, Australia, and several cities in the United States, this package of incredible tunes solidifies a bond in music that&apos;s worldwide. These are all downloadable Do Androids Dance exclusives that can add flavor to any DJ set, or destroy the sound system in your mom&apos;s sedan. I would also like to end this post on a random note, and point out that YOOK!E might have the best SoundCloud URL ever.